Monday, January 4, 2016: Up and on the road shortly before 1000 under cloudy skies and temperatures in the low 50’s. This morning we are leaving Las Vegas and heading down south to spend more time with my desert dwelling family in Tucson, and to participate in the celebration of a very important milestone. 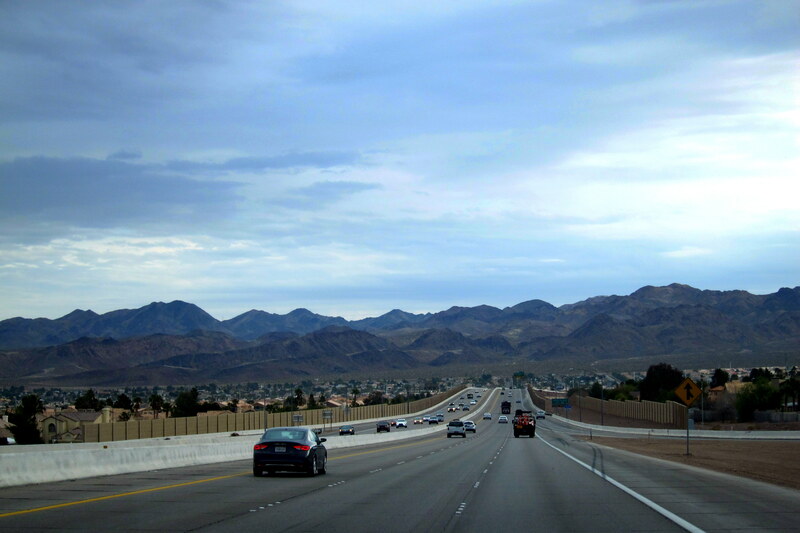 A few weeks ago, Kit and I drove up from Arizona via US-93 which lies to the east of the Colorado River…..so just to be different and for a change in scenery, we decided to return by heading south on US-95 which lies to the west of the river. About an hour later, we rolled across the border and entered the State of California and then crossed Route 66, a historic east/west roadway we have explored on previous Excellent Adventures. 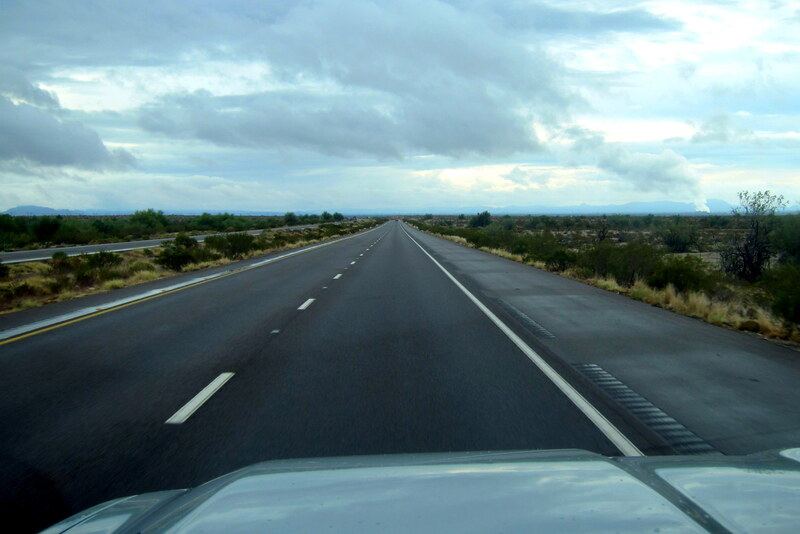 As it began to lightly rain, we intersected I-40 and headed east crossing into Arizona near the town of Topock at 1300 hours. At this point, we also entered the Arizona Mountain Time Zone (AMTZ), as opposed to the more common Mountain Time Zone (MTZ). Why the difference? Well, most of the state of Arizona does not observe Daylight Savings Time (DST). So, why doesn’t Arizona go along with the rest of the country? (Boy, you guys sure ask a lot of questions!) 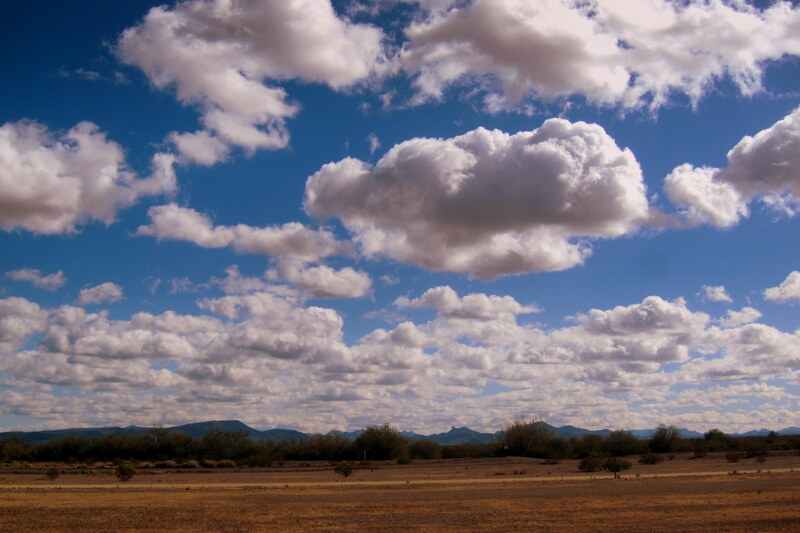 Well, it just isn’t cool (pun intended)…..the last thing Arizona needs to conserve is daylight! Especially during mid-summer as the temperature hovers around 110 degrees and most Arizonians do not need the sun beating down on them until late in the evening. So back in 1968, the Arizona Legislature, in a near unanimous decision, voted to permanently opt out of daylight savings time. However, the statement I like the best came from the Hopi native people of Northeastern Arizona: “Only the white man’s government would be so stupid as to cut a foot off the top of a blanket, sew it onto the bottom, and think they have a longer blanket.” Yep, pretty much sums it up! Speaking of quotes, remember the one that graces this issues masthead? (OK, I’ll wait while you go back and read it.) Generally, the selected quote parallels the main storyline of the current issue or at the very least, compliments it…..this particular quote is spot on to the “adventure” we were about to experience. After two weeks glamping (Google it if you must!) in Las Vegas, Kit and I decided that our next camping opportunity would be more rustic. Which is more to our style anyway as we thoroughly enjoy National Parks, State Parks and the various municipal parks featured in many small towns across America. 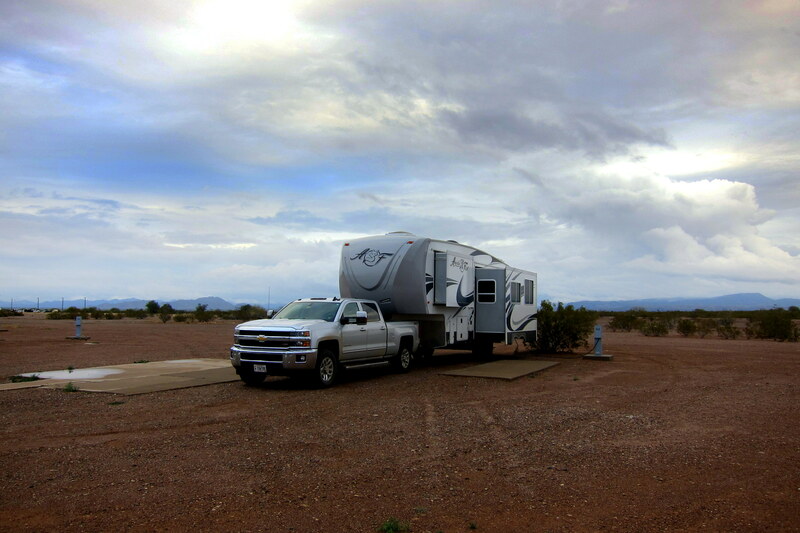 So today we decided to head for Alamo Lake State Park which is located in west-central Arizona, 38 miles from the nearest town…..and when accessed from the north, down a rather long dirt road. Not a problem, we have drug our previous campers along many an unimproved road and this particular unit is built to handle the rough terrain…..to a point. 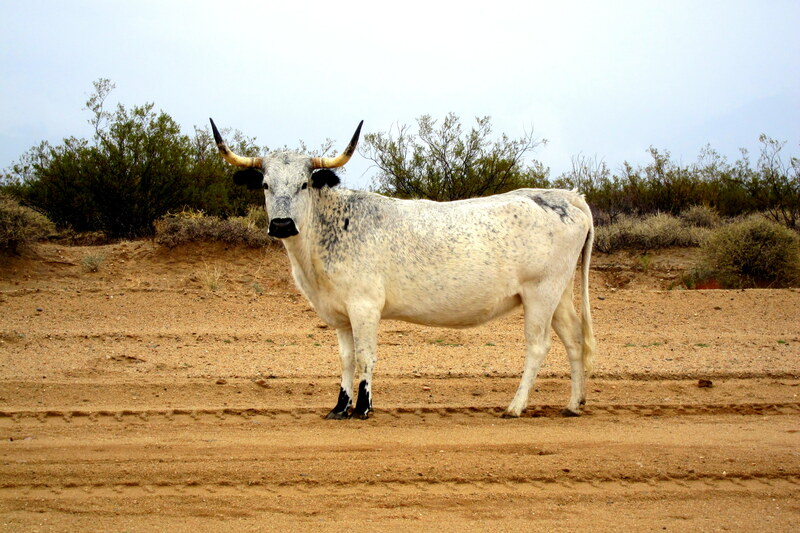 As Kit and I slowly rumbled along enjoying the rough but scenic ride, we noticed this area of Arizona is designated “open range land” and as such is the domain of more livestock than people. As we passed, many of the area’s residents stopped what they were doing and gazed at the crazy gringos pulling a house behind their truck. I carefully maneuvered the rig to the far side of the road to minimize any road rage confrontation, after all their horns were far bigger than the trucks! Everything was going OK, even as the road started to get a bit rougher…..I just slowed the rig to a crawl remaining confident that Alamo Lake State Park would be just around the next corner. Soon, we started noticing a series of intersecting “roads”…..some that looked promising either narrowed to game trails or became way too rough to navigate safely. Recovering from these “detours” resulted in some creative multipoint U-turns or very long retreats in reverse. I should have taken that as a sign…..or i could have just as easily paid closer to this sign we spotted an hour ago! But, no…..that sign seemed more like a dare! Stopping to take a bathroom break, we discovered that the camper can handle the rough terrain, but not so much the interior contents! That mess will have to wait until we get to our destination, which surely cannot be too much farther. 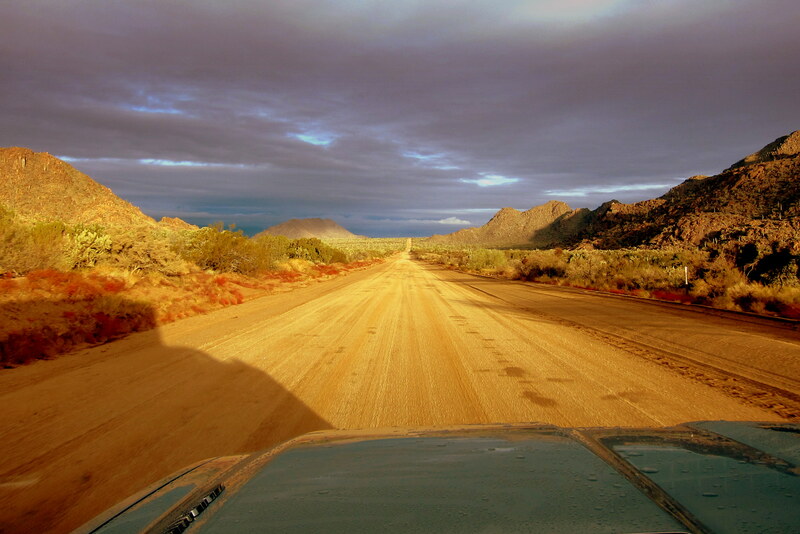 After all, we have been on this 38 mile dirt road for over three hours! As the rig climbed to a higher elevation we could see water in the distance…..it just had to be Alamo Lake, right? It appeared to be just a few miles down the hill and off to the right….just to the other side of a rather large wash!?!? 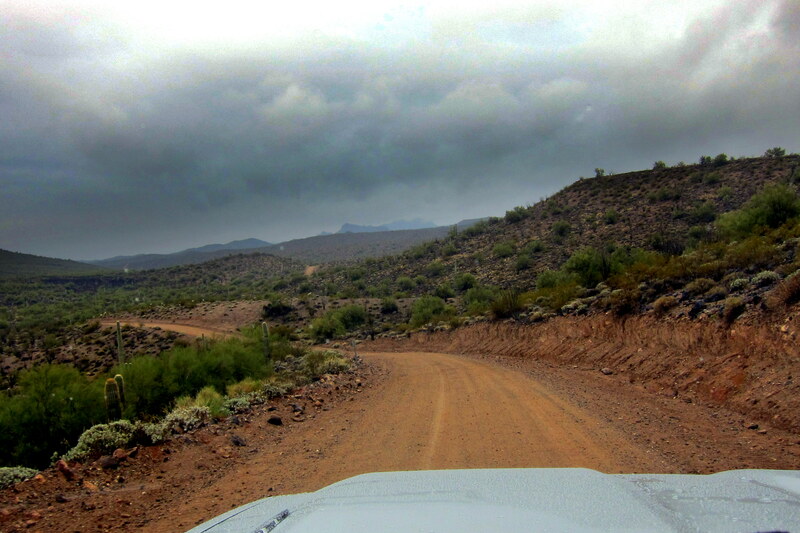 For those not familiar with that term, a wash (also known as an “arroyo” in the desert southwest) is a dry stream bed that can quickly fill with torrents of water during the rainy season and this particular wash already had a bit of water flowing through it…..and the darkening skies foreshadowed more rain! Undeterred, I (notice the narrative has shifted from we to I, yep Kit has wisely decided this was now my project!) motored onward. As the truck eased down the hill, all eight tires lost traction and we started sliding sideways…..Yikes!! Fortunately the GM traction and sway control systems kicked in and straightened the rig out, thereby safely controlling our decent. Gotta love modern automotive technology…..it sure saves one from their own stupidity!! It was time to call the ranger at Alamo Lake State Park as Kit suggested…..an hour ago. 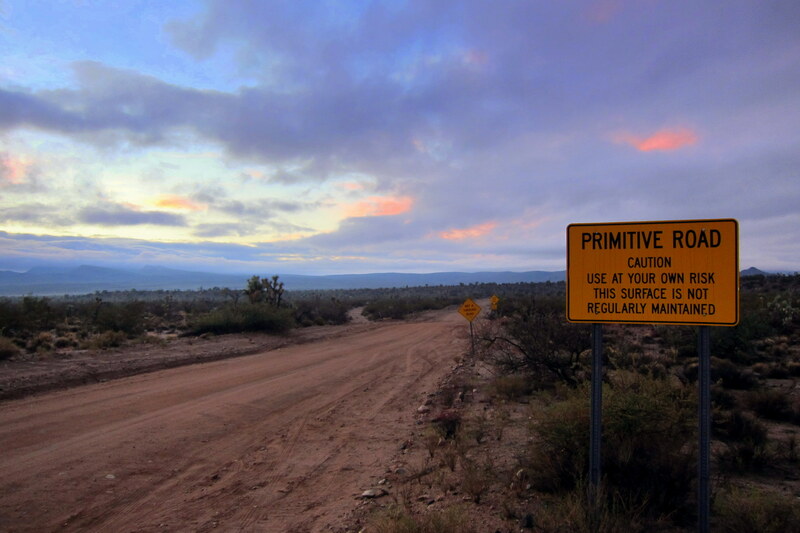 After telling him where we thought we were, he mentioned there was an easier way to get to the state park but the road we were on would lead there as well…..as long as you had a high clearance vehicle with four-wheel drive (Check!) and, weren’t towing anything larger than a small aluminum boat (Un-check!?!?). Seems we would have to ford that water filled wash we had seen from the hill. Since it was getting late, I asked about boon-docking right where we were. The ranger confirmed that a rain storm was heading in from the west and would likely fill the wash with even more water so he highly suggested heading for higher ground. So I did an about face, shifted the truck into four wheel drive and headed back up the hill we had just slid down. 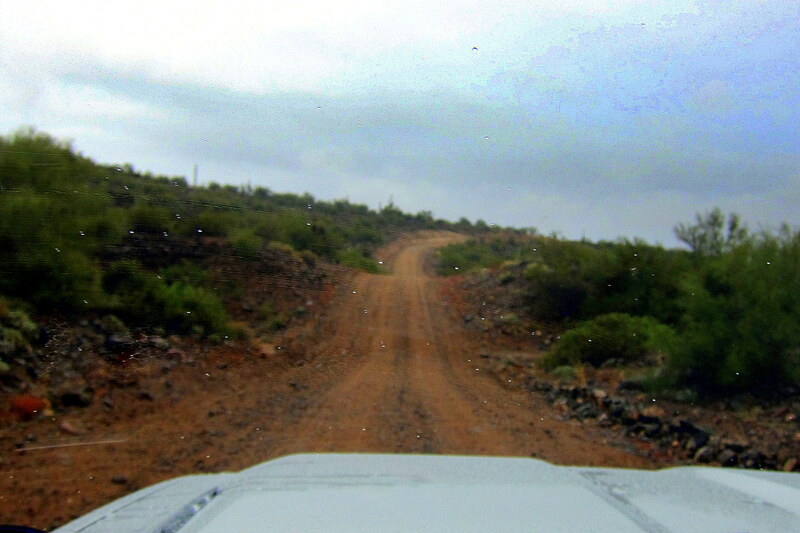 It then began to rain, not only reducing visibility but also making the dirt road a bit greasier. About half way up the hill, our tires began losing traction, the truck slowed, and I tried to keep momentum by feathering the throttle while the trucks traction control system once again came to the rescue by finding the best combination of speed and power to maintain forward progress. Just when I thought we may be boon-docking on this hillside, the truck crept over the summit and back on somewhat level terrain….whew! Heading back north, on the same road we were traveling a few hours ago, it started to rain even harder and the road became very muddy. At the next flat and wide spot on the road, we pulled over for the night as vultures began circling our bivouac sight. OK, there were no vultures, but there were coyote’s howling late into the night…..Kit was not a happy camper (pun intended)! Tuesday, January 5, 2016: Up at 0643 as the sun rose in the east on an otherworldly landscape…..Kit referred to our predicament as lost on the surface of the moon! It is a bit remote and isolated and desolate…..but possesses its own unique beauty. 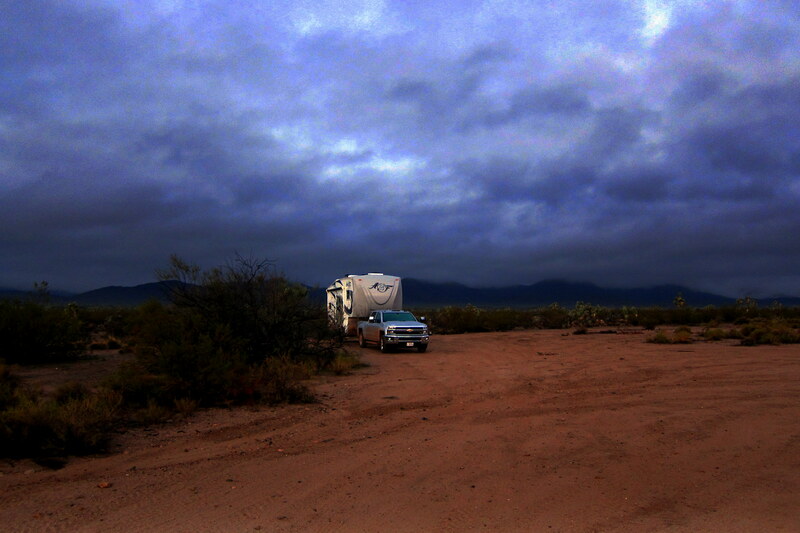 Last night was the darkest of any campsite so far on any of our Excellent Adventures…..too bad it was overcast as I bet the heavens would have provided a spectacular display! To illustrate the remoteness of our wilderness camp spot, I captured the below image off of Google Maps. Notice the lack of roads? Most of the trails we were on didn’t even register on the GPS! What was I thinking? Kit would tell you that I wasn’t! 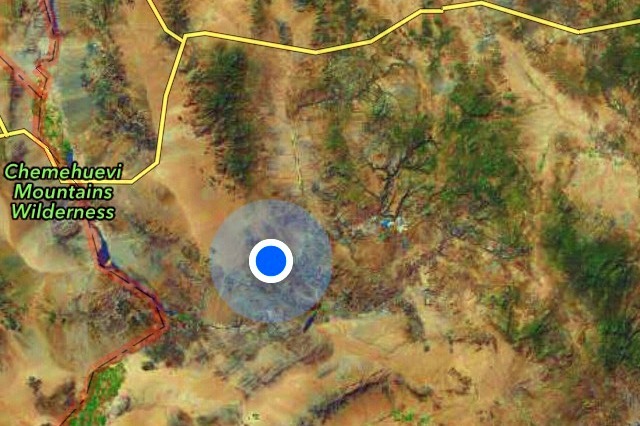 Oh, and that little blue area lower and to the right of our position was Alamo Lake…..oh so close! Not wanting to tempt fate, we hit the (dirt) road and continued northerly. 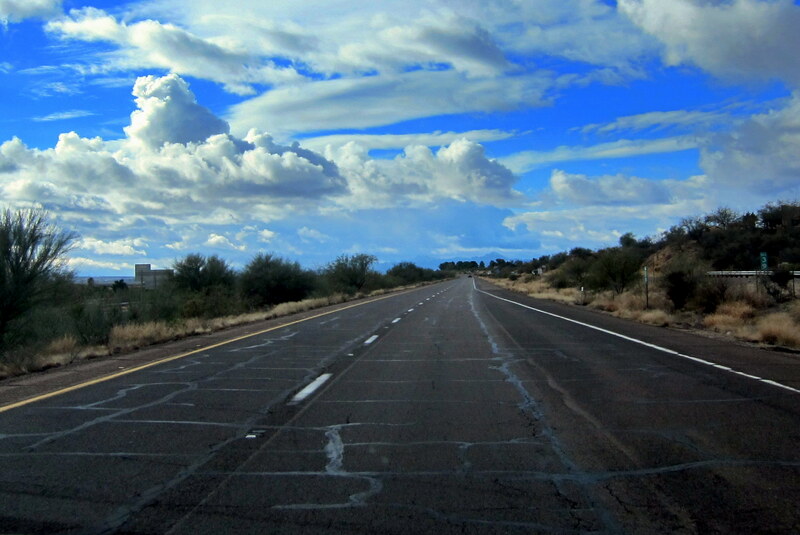 Traveling along, we must have been right on the border between Pacific Time Zone and the Arizona Mountain Time Zone as the clock on the truck’s navigation screen kept flopping back and forth…..sorta like that episode of The Twilight Zone!?!? 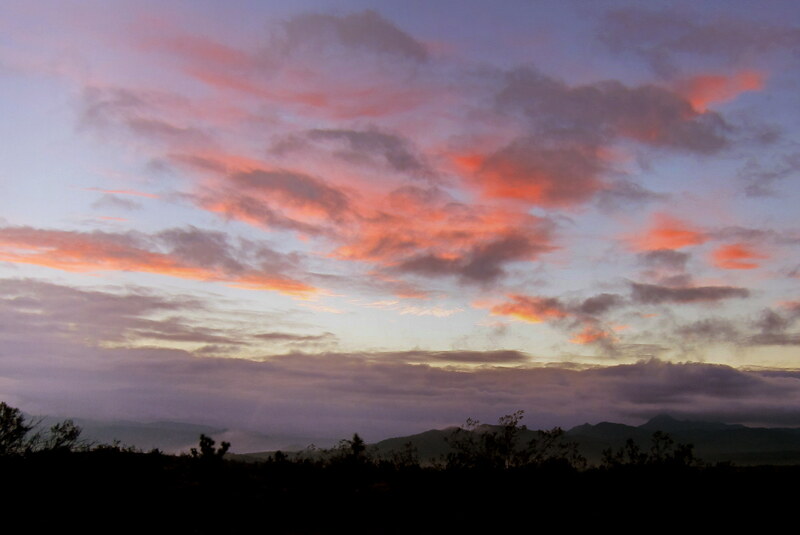 A short time later, the sun rose above the clouds and brightly illuminated the road ahead. 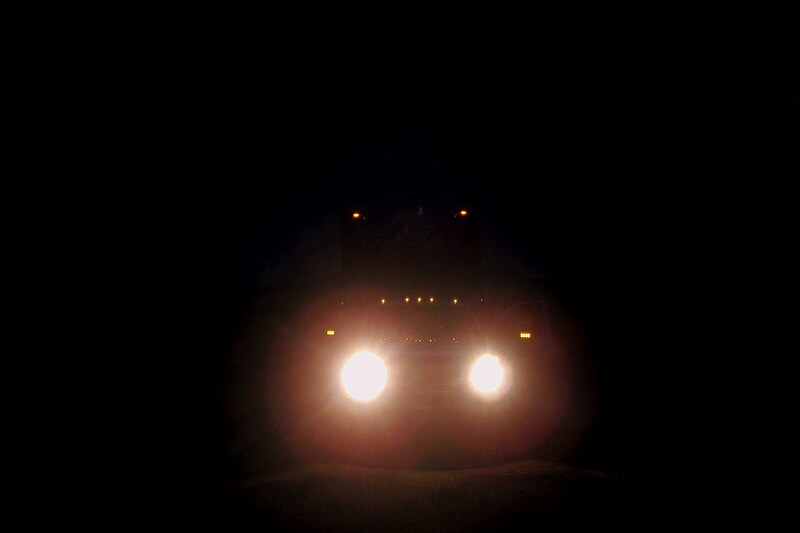 Near a roadside mountain range, I stopped to take a “hero photo” to capture our “Light at the End of the Tunnel” moment! Notice how dirty the truck and trailer is in the above photo? 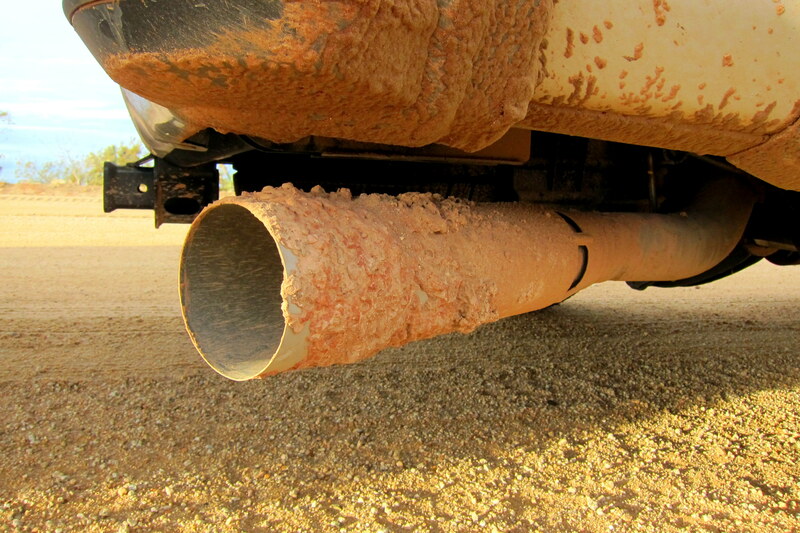 There was mud caked everywhere…..even baked on the trucks exhaust pipe! Finally, at 0856, some 20 hours after we had last left it, we found the blacktop road that led back to I-40…..life is good! Well, that was a 124 mile trip to nowhere! Kit and I (especially Kit) had more Excellent Adventure than we (she) could tolerate so we stuck to the blacktop road as we headed east before intersecting US-935 in the town of Kingman. 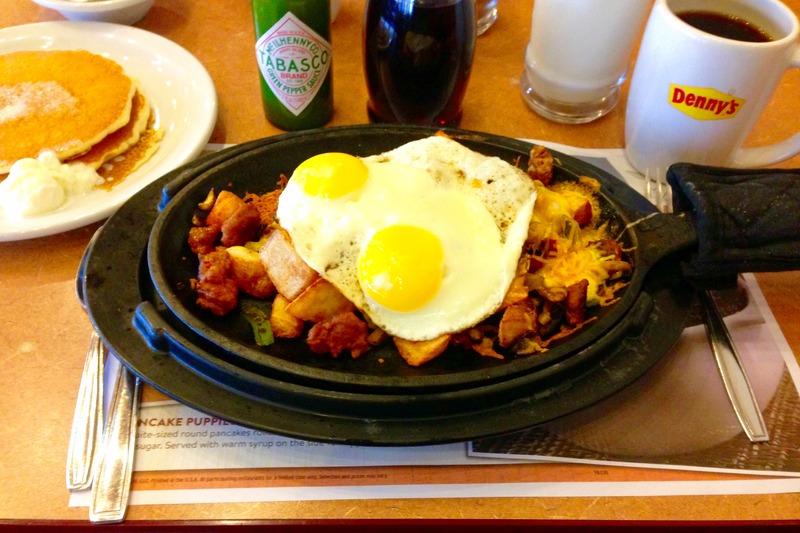 Since we made tracks (literally) before getting breakfast, we pulled into a Flying J Truck Stop for a hearty meal. 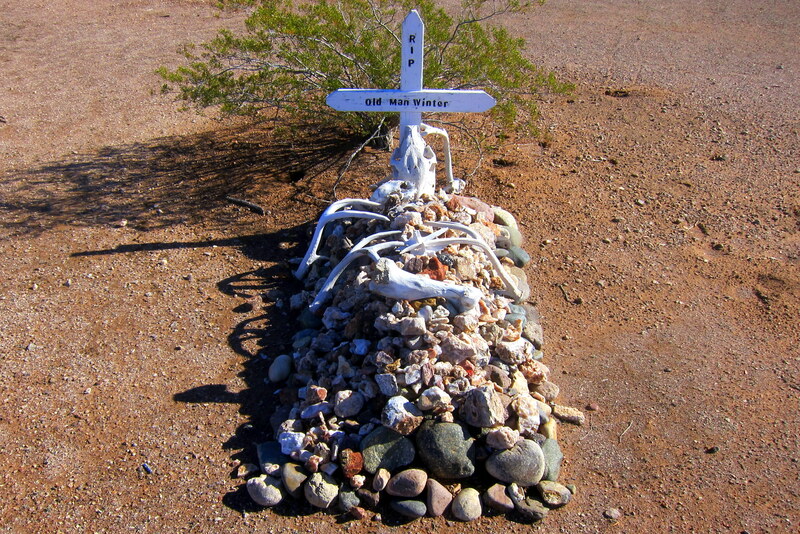 Forgoing our plan to visit Alamo Lake State Park, even though Kit discovered an easier but longer road to the park from the south, we diverted south to Gila Bend, Arizona. We found a nice camp spot for the evening at Luke Air Force Auxiliary Field. 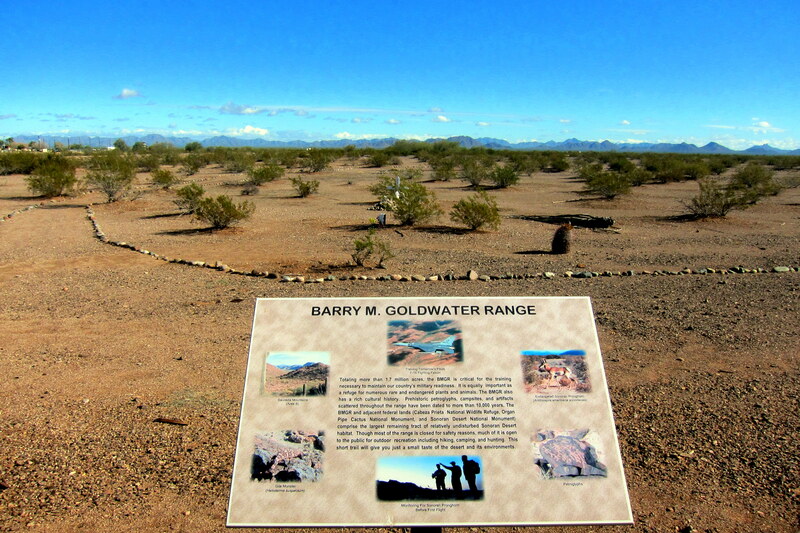 Wednesday, January 6, 2016: This remote Air Force base is on the edge of the Barry Goldwater Bombing Range…..oh boy, another adventure in the making. This base not only serves as a divert field for Luke Air Force Base up in Phoenix, but is also used for training pilots in high rick maneuvers and for loading munitions for active bombing practice…..oh, and as a repository for old retired military folks to spend the winter!?!? The base is so remote that the only potable water comes from individual Reverse Osmosis systems at each campsite. However, discounting the jet noise, and the distant rumble from bombing the heck out of the desert, this is a rather peaceful place…..honest! Well, at least the price is right…..$10.00 for full hookups and a free laundromat! In addition, there is a nice walking path complete with information signs explaining the terrain and vegetation, which Kit and I enjoyed. Breaking camp at mid-day, we pulled out and made our way onto I-8 heading east. 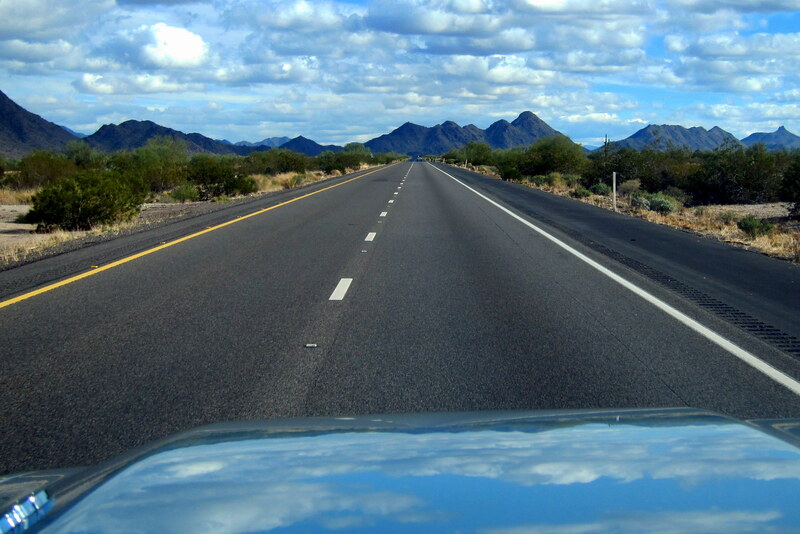 In a few minutes we intersected I-10 which would take us to Tucson and by midafternoon found us pulling into Catalina State Park in picturesque Oro Valley. 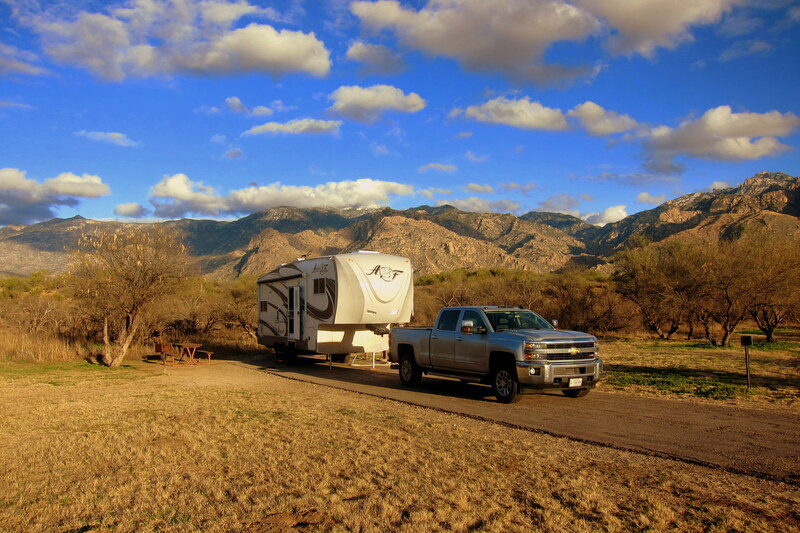 This very nice state park is nestled in the foothills of the Catalina Mountains and only a short distance from Tucson…..it has become one of our favorite Arizona State Parks! After a nice meal and a refreshing nightcap we turned in to read before the howling coyotes lulled us to sleep. Thursday, January 7 through Tuesday, January 12, 2016: Catalina State Park, Tucson, AZ: We returned to the Tucson area because not only is this where part of our western family resides but in addition there is a very important birthday celebration we wanted to attend. 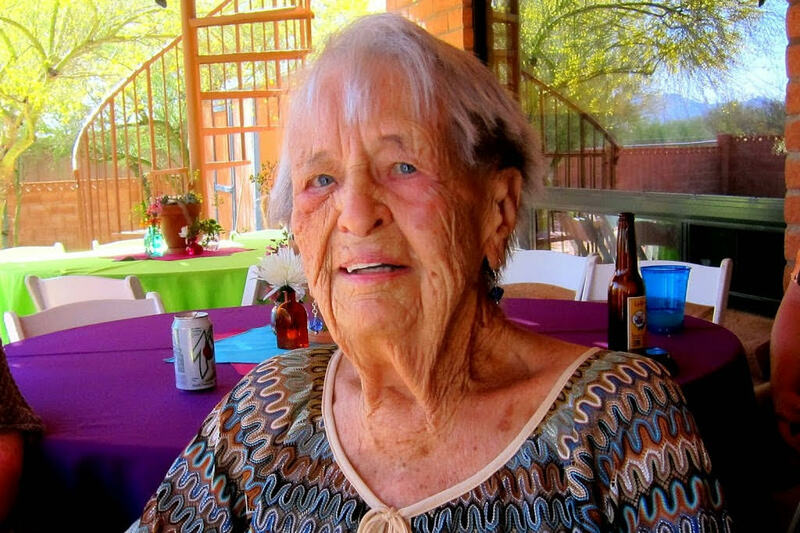 Our sister-in-law’s mother, turned 100 years old on Sunday, January 10th! Emily, shown above with her daughters Bea and Jo, is a remarkable woman who pretty much lived independently until a few months ago. She is alert, bright, and quick witted…..her stories of the things she has seen and done are thoroughly entertaining. Family members came from Minnesota, Wisconsin and Colorado to help this outstanding woman celebrate her major milestone. This topsy-turvy weather pattern we have been experiencing has the weather guessers scratching their collective heads. Global Warming has become Regional Warming as the entire northern tier of the US is indeed warmer than normal…..and in the warm, sunny, southwest we are experiencing Regional Cooling as evident by snow in the nearby Catalina Mountains! Regardless of how cool this area is, it is still warmer than most of the northern United States so for now we will stay put…..if things change then a trip deep into Mexico may be in order to seek out the warmth that we snowbirds deserve! 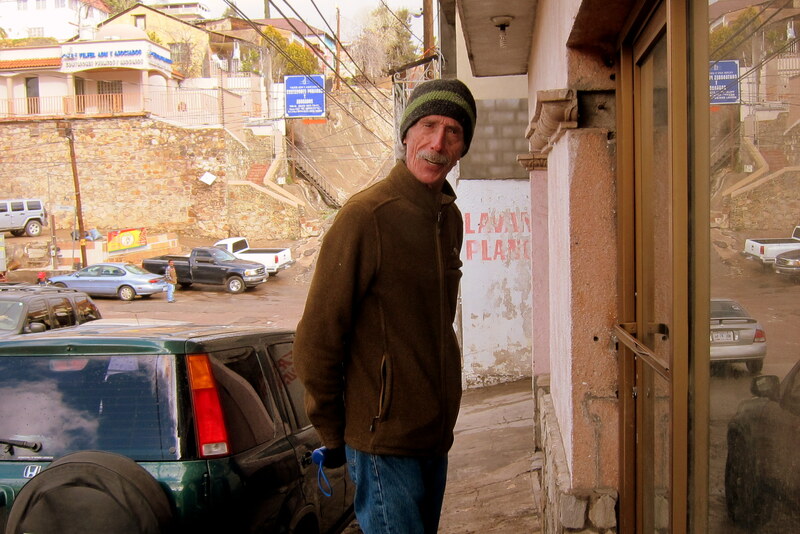 Speaking of traveling south of the border, I did accompany bruzzin Dewey into Nogales, Mexico one fine day. 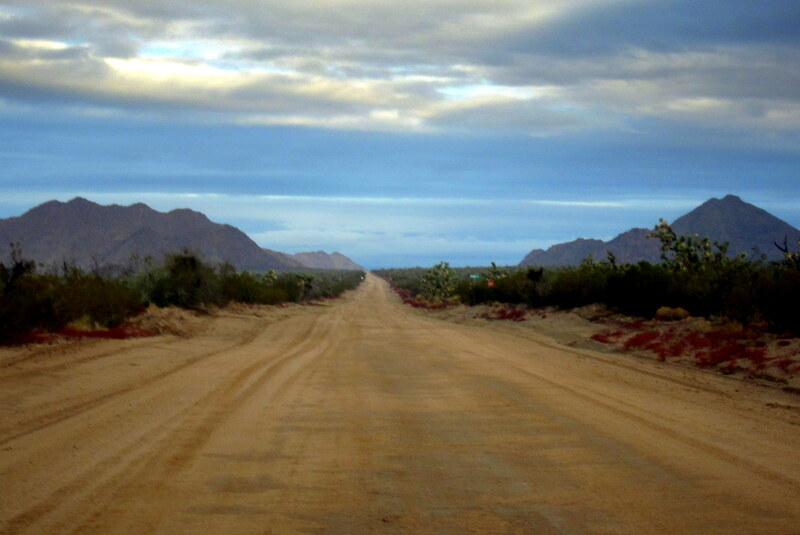 Traveling south through the remote desert on the famed CANAMEX Highway was a surreal experience after the congestion of metropolitan Tucson. 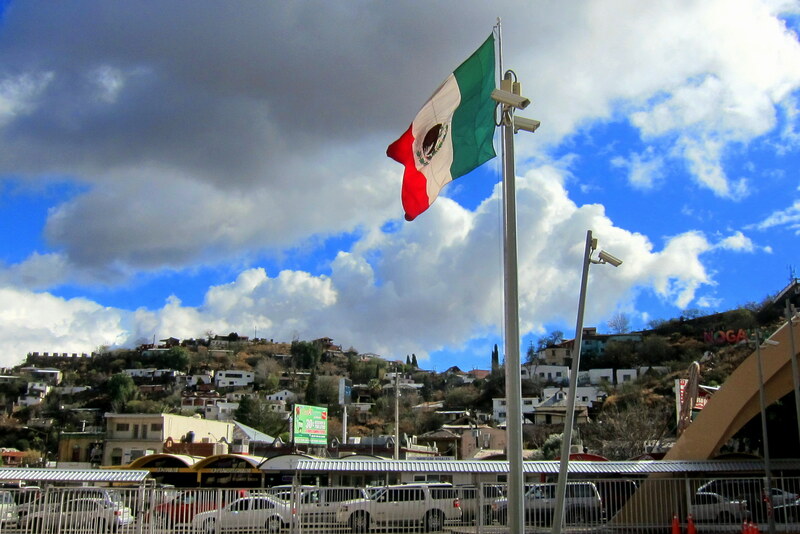 At the town of Nogales, Arizona, population 20,456 we crossed the international border with zero attention paid to us by the Mexican border agents…..
…..and entered the city of Nogales, Mexico, population 212,532…..yep ten times larger! And the population density is many times larger as well!! 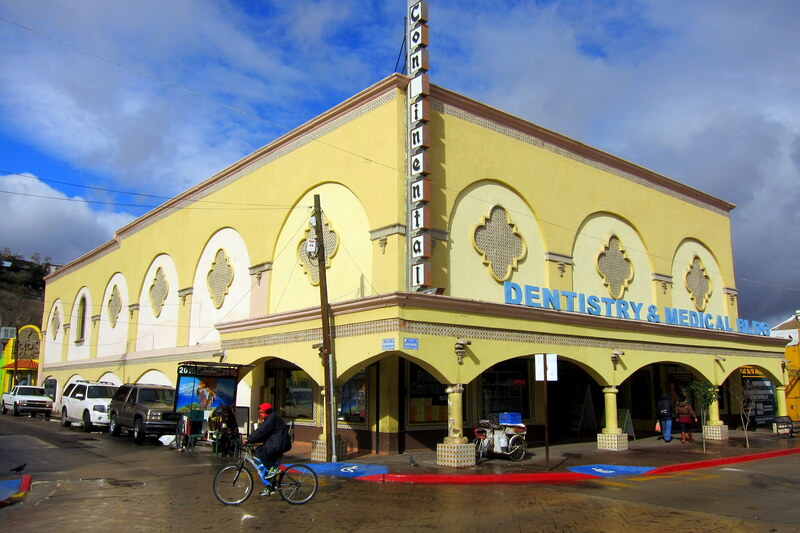 The two border towns have shared a symbiotic relationship since the very early days of their existence. 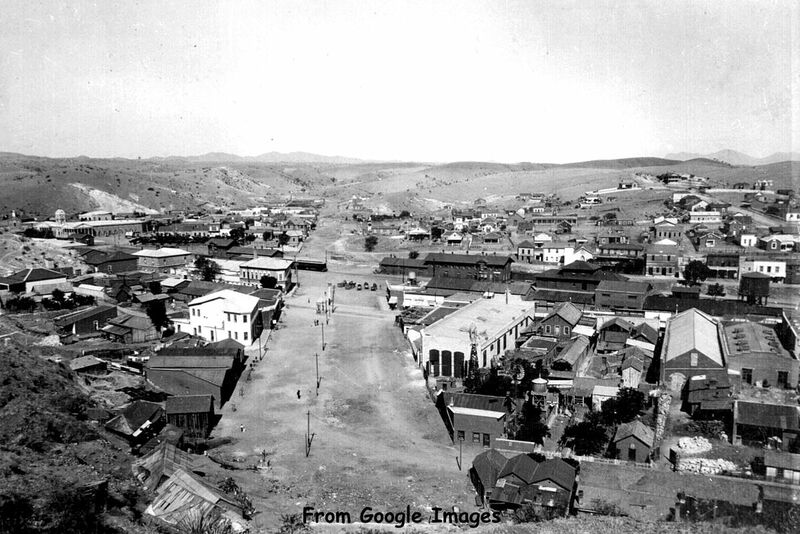 The photo above was taken in the early 1900’s and shows just a strip of vacant land separating the two nations…..today there is a substantial fence. Notice the graffiti that sez: “You Can’t Trump Our Fence”? OK I made that up…..sorry, the election silly season is getting to me. Actually the portion of the fence that I could see was devoid of vandalism, unlike the US side. It seems strange that what appears as a thin line on a map is a barrier that one can thread through and enter another country to experience its unique culture and traditions. Bordering the border there are many stores, small business and eating establishments on both sides. 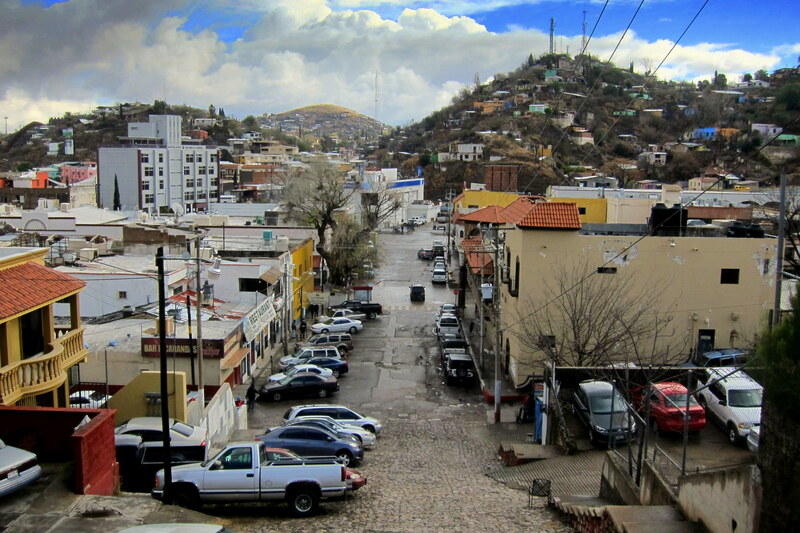 Nogales, Mexico is a cosmopolitan city with major factories and medical practices that cater to the US population who acquire products or obtain medical and dental care. 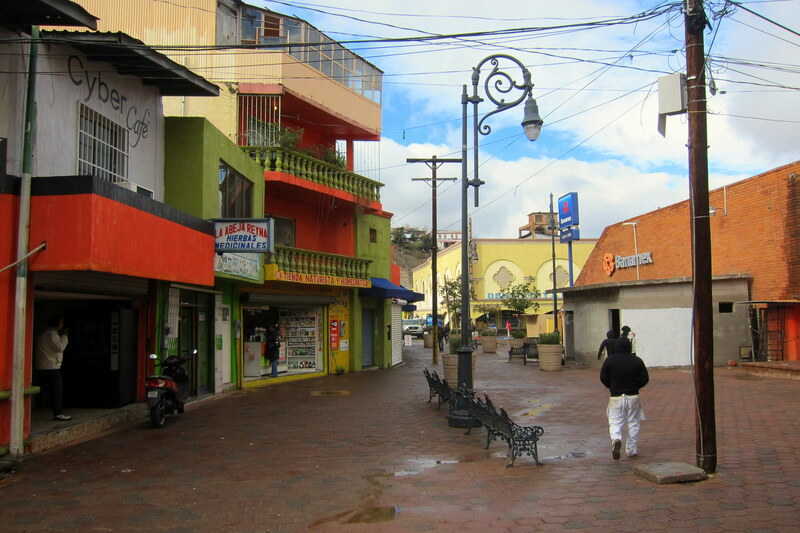 Walking away from the tourist areas, one senses the true character of the Mexican people. Everyone we met was happy and courteous, interested in where we were from and what it was like north of the border. Along the back streets, one is likely to bump into a famous resident…..such as the infamous El Guppy. 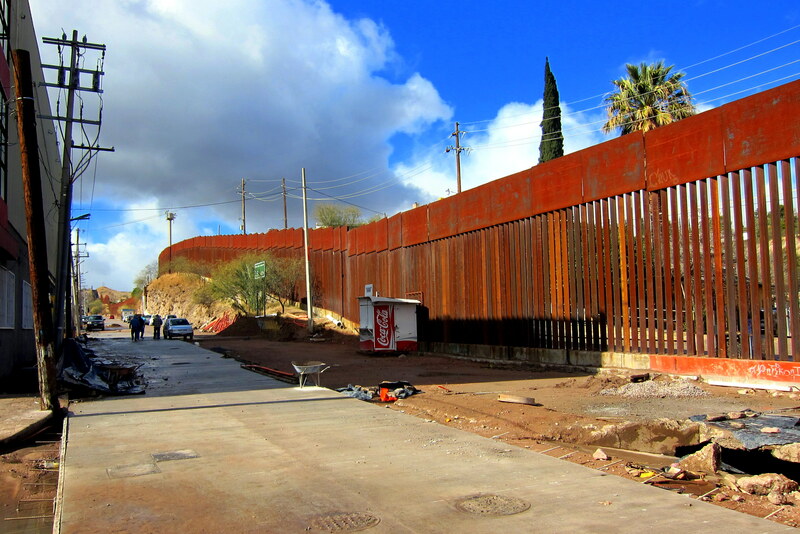 Following El Guppy’s dental work, we made our way back to the border and endured the surly Border Patrol folks that seem to staff many of these crossings……many of these folks need some human curtesy training! Heading back toward Tucson, we detoured through the small village of Tumacacori and stopped at Wisdom’s…..a legendary Mexican Restaurant. 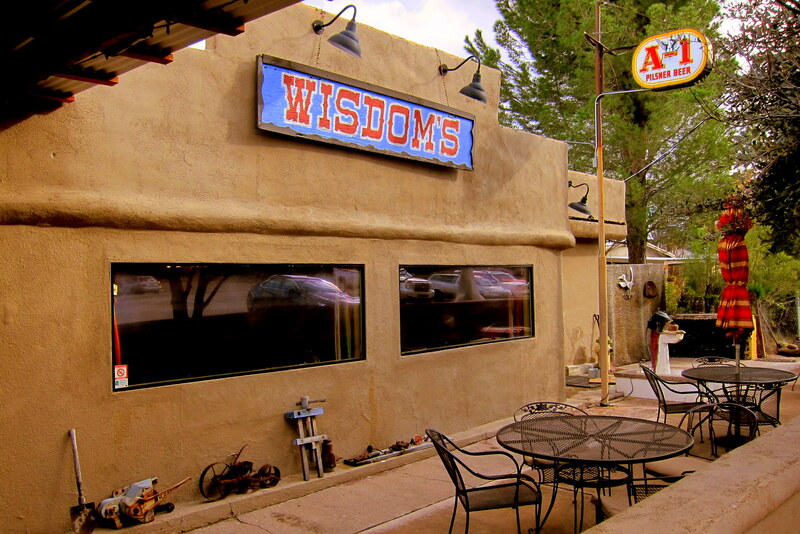 Among the many delicious authentic Sonoran dishes they feature are a few items original to Wisdom’s. 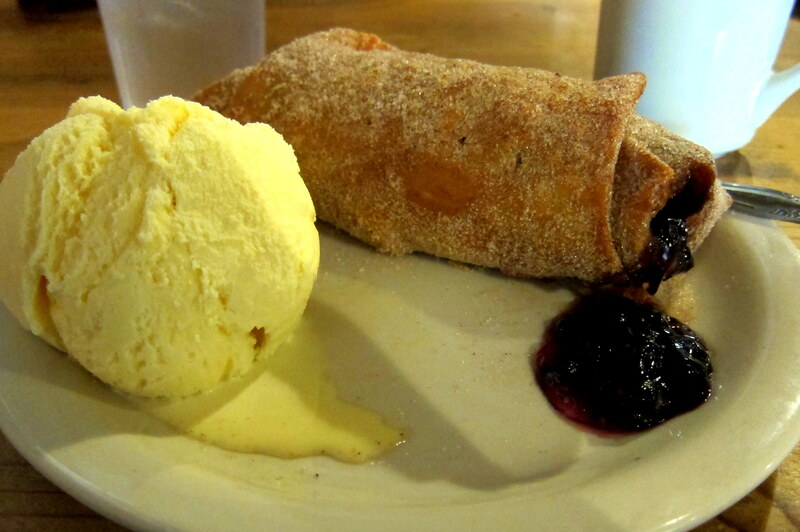 One such specialty is called a Fruit Burrito…..a flour tortilla wrapping various fresh fruit and deep fried before being rolled in cinnamon sugar. Yep, it’s as good as it looks! Back at El Guppy’s hacienda we were treated to a fine meal and drinks by Senorita Beatrice, before Kit and I returned to the campground for the evening. 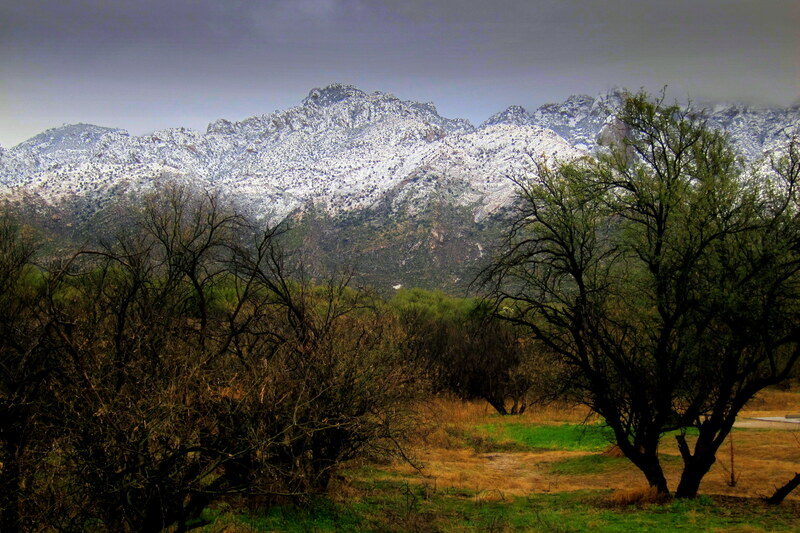 Every morning at Catalina State Park was a different display of Mother Nature’s best as the sun peeked over the Catalina Mountains…..on clear days the shafts of sunshine were dazzling, and on overcast days, it was far more brooding and dramatic! 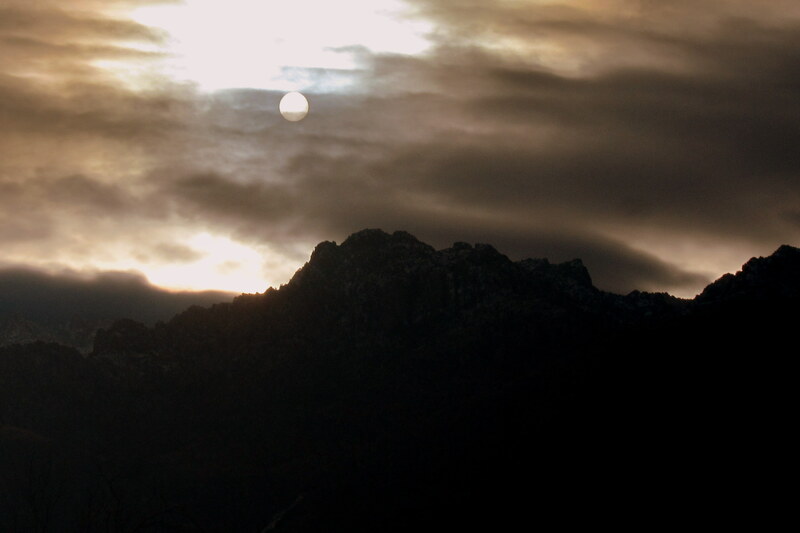 IYep, that’s the sun trying to penetrate the clouds…..not the moon! Also entertaining us around the campsite were these little guys! Contrary to their name, I never witnessed one actually running down the road, or come to think of it, a coyote sprinting off a high cliff, or an anvil appearing out of nowhere to follow the hapless coyote to the ground…..guess that only happens in cartoons. 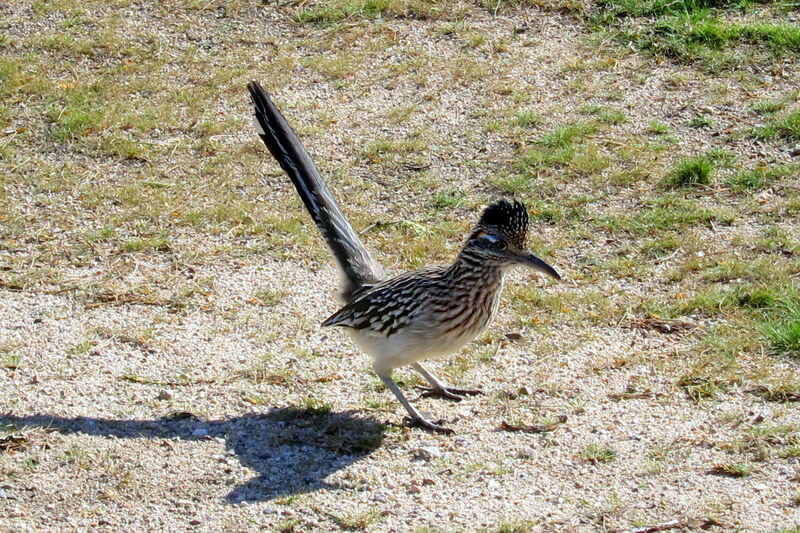 However, I was able to get real close to this fellow as he mined the earth for his breakfast. 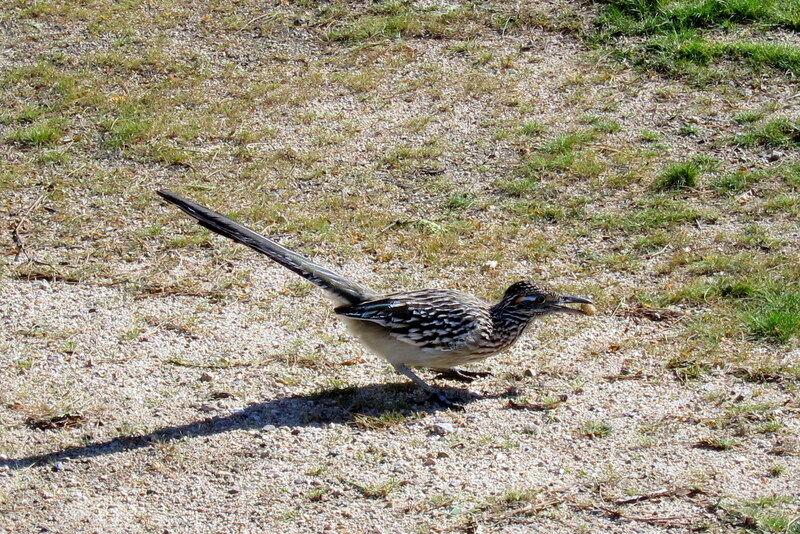 There were also lizards, bunny’s and coyotes about…..the first two were way too fast to capture on film, and the last one only made their presence known after sunset. 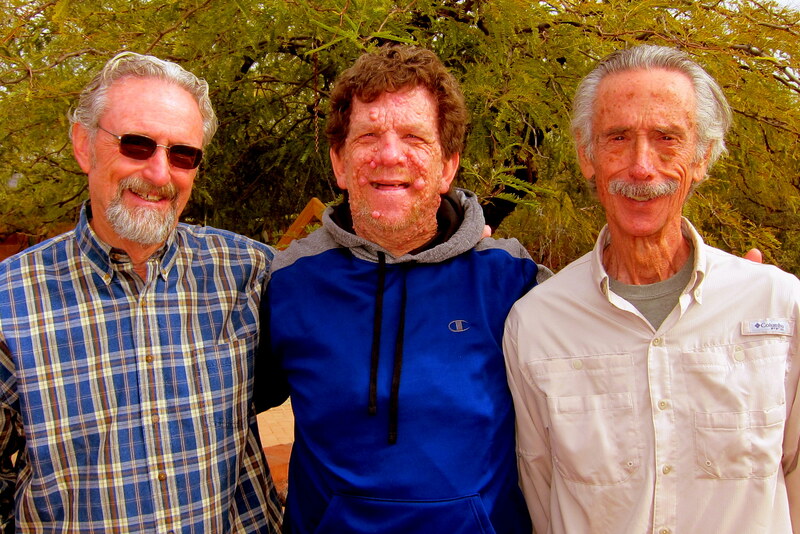 My two brothers live in Tucson, and one of the highlights of our stay every year is to share time, experiences, and meals with them. My family tree is a bit convoluted…..actually it’s shaped more like a telephone pole! However, I consider both these guys my brothers and love them very much! Catalina State Park has an extensive multiuse trail system that is very well marked and leads to some incredible backcountry scenery. 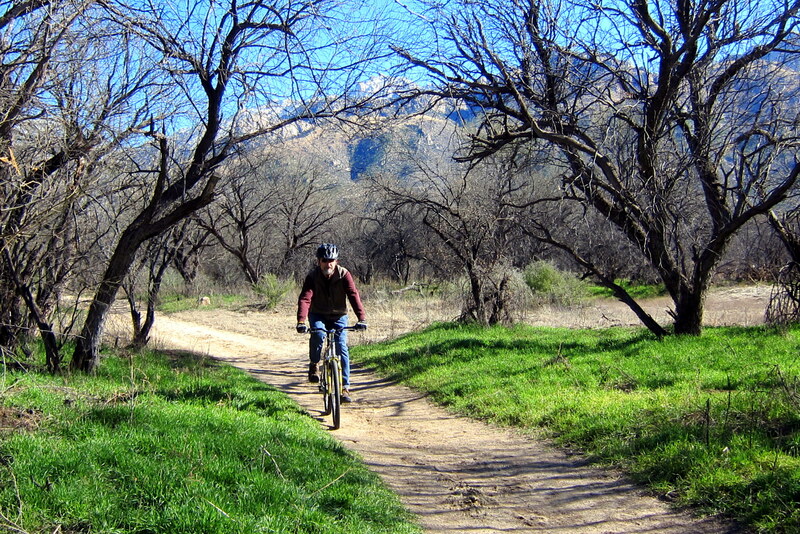 On a few occasions, I took my bike out on these trails to explore the terrain. 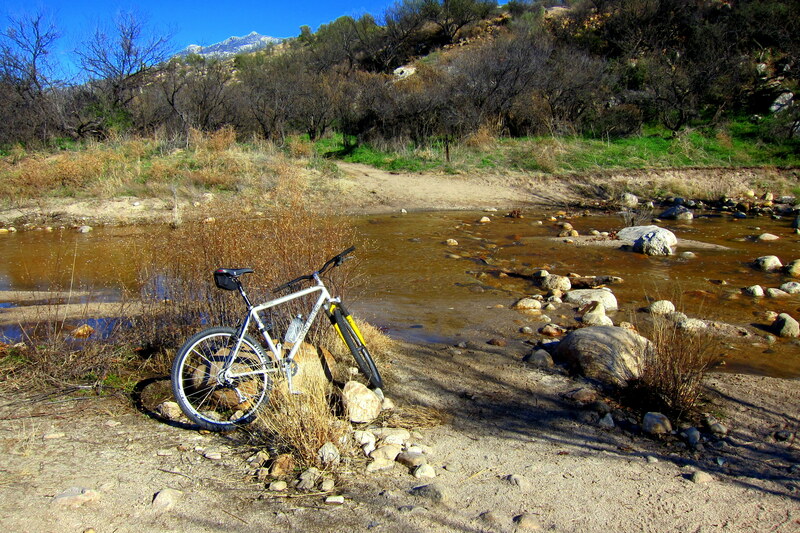 Consisting of mostly double-track, these well maintained trails have very little elevation gain but do feature some interesting creek crossings. Fortunately the creek beds were rock free, hard packed, and fairly shallow. Other than getting my boots wet, they were a fairly easy crossing by bike, or horse…..did I mention this was a multiuse trail? 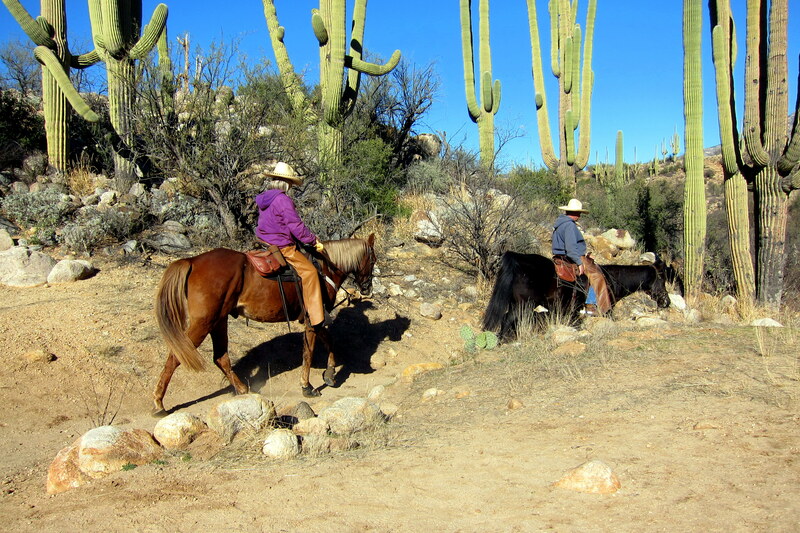 Whenever I encountered an equestrian, I would slow, pull to the side of the trail, and let the animal and rider pass…..this courtesy was frequently acknowledged by the rider, which was nice. However, there were a number of ‘road apples” left on the trail by the well fed horses…..why aren’t they required to carry blue bags on the trail like responsible dog owners do???? 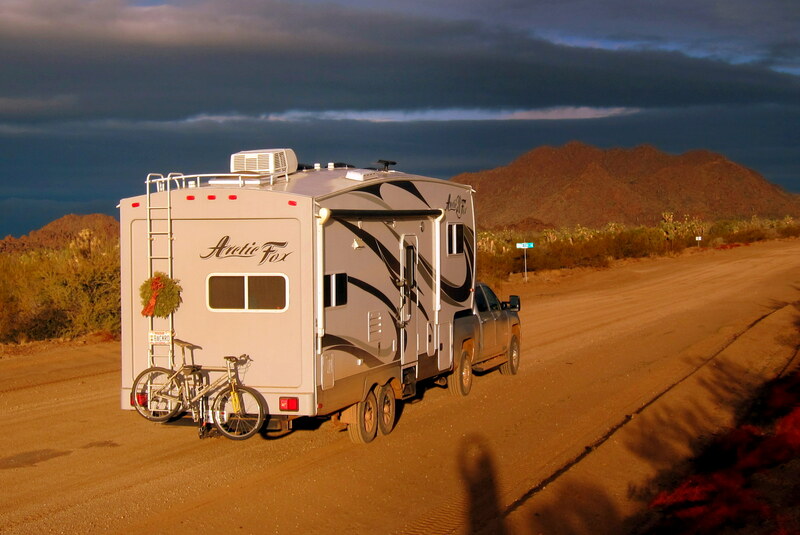 Well, it’s time to leave Catalina State Park and relocate to another campground south of Tucson…..stay tuned! 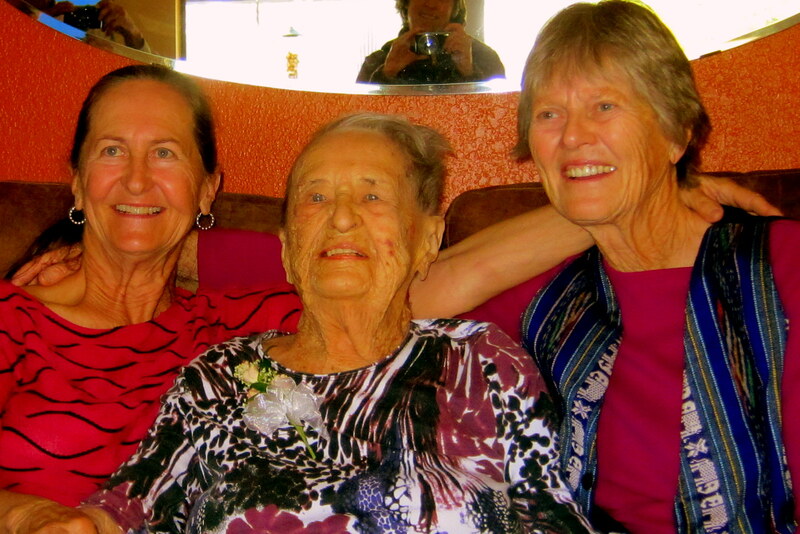 The highlight of this part of our visit in Tucson was Emily’s 100th Birthday! Such a delightful party for a beautiful woman! Your daughters, Bea and Jo, are so fortunate to have you! So, on our little Alamo Lake adventure, Bill forgot two important incidents. Towards the “sliding down the hill” thing, twice, we had to cross piles of big boulders! He must have thought we were driving a Jeep or something, because we just rumbled over them like it was nothing! I was prepared to roll into a ball to survive, had we tumbled over on our side. I had no clue as to how we could be rescued, had it happened. The landscape out there made me think of the Mars Rover, “Curiosity”, which we know a bit about from Bill’s cousin Donny, in York, PA. Seriously, though, camping out in the boonies for the night was awesome! I loved it! You know, there are like a thousand Murder Mystery Novels that begin much the way your Alamo Lake story did. How terrifying for you Kit and how many times did Bill Woo-hoo?! You really were lucky your rig & truck held together so well——-or else, it might have been Spring before anyone found you……..
One wild adventure after another. It did sound like The Twilight Zone. I saw Kim and here you are in CA. Looking forward to # 7. Hang on tight! Bill,when you write the book, I think directions to Alamo lake might be well excluded. By the way how could you afford enough reverse osmosis water to wash all that mud from the rig?? A good thing there were no branches over hanging that remote road, seems I recollect an expensive tear in the roof on one off road adventure and some under carriage damage on another. Wow! 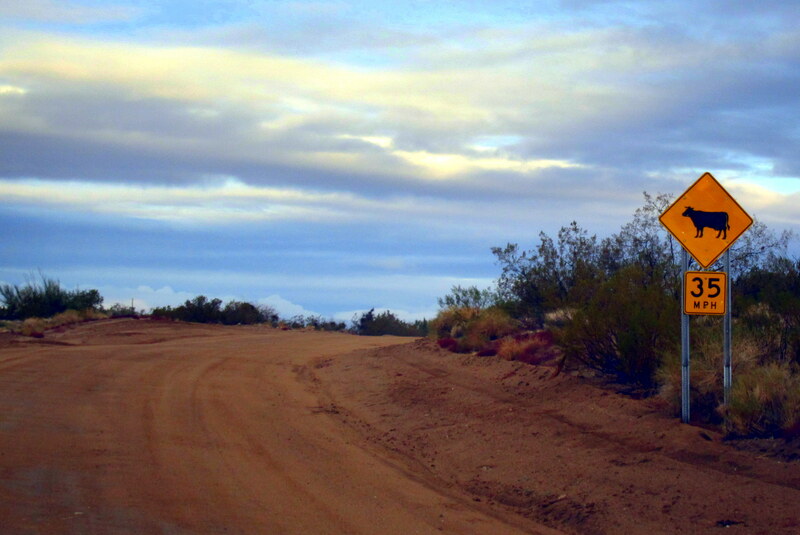 Having lived in Arizona I’ve seen many of those primitive road signs…but I turned AROUND! 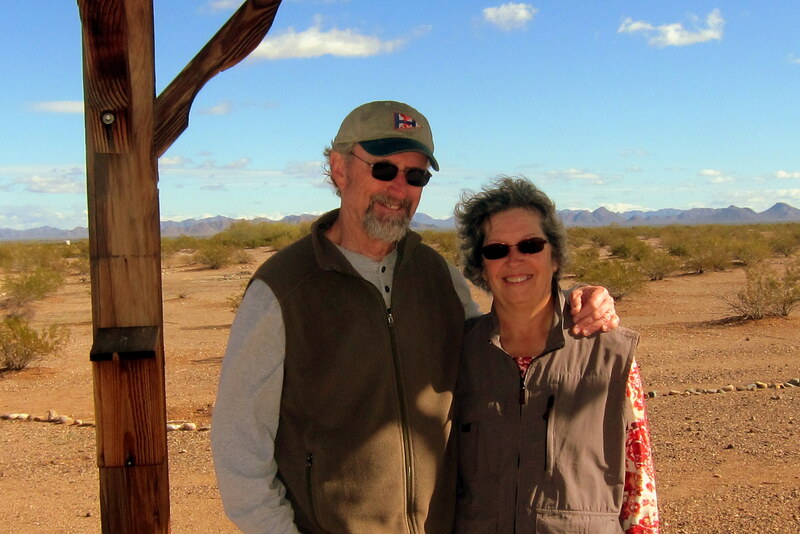 Wow… You are like the Jacques Cousteau (probably spelled wrong I’m sure) of the Desert! 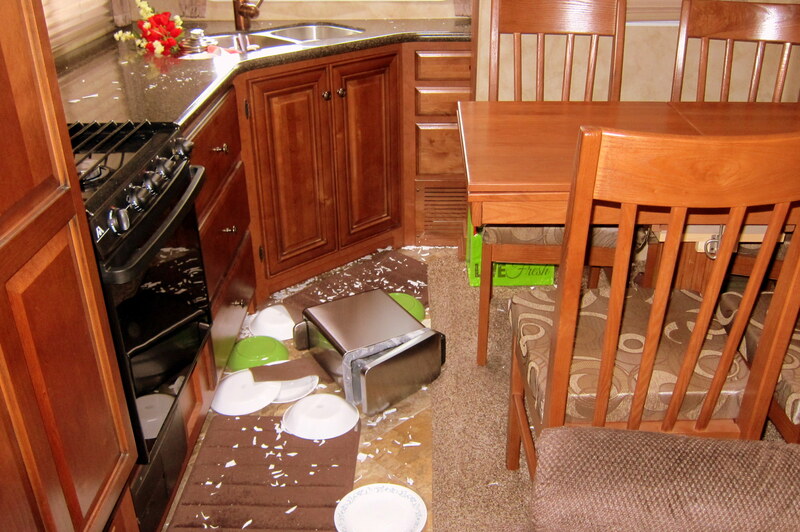 Glad you decided NOT to camp in a wash …double YIKES! But….I honestly wish I could have been there.I miss Arizona with its howling coyotes at night, primitive roads, and those beautiful saguaro cacti you can only find in the Sonoran desert!!! I miss seeing those….. This journal was the most suspenseful one yet!! LOVED IT!! !